Looking for something rich and delicious for dinner? But it has to be fast & simple? 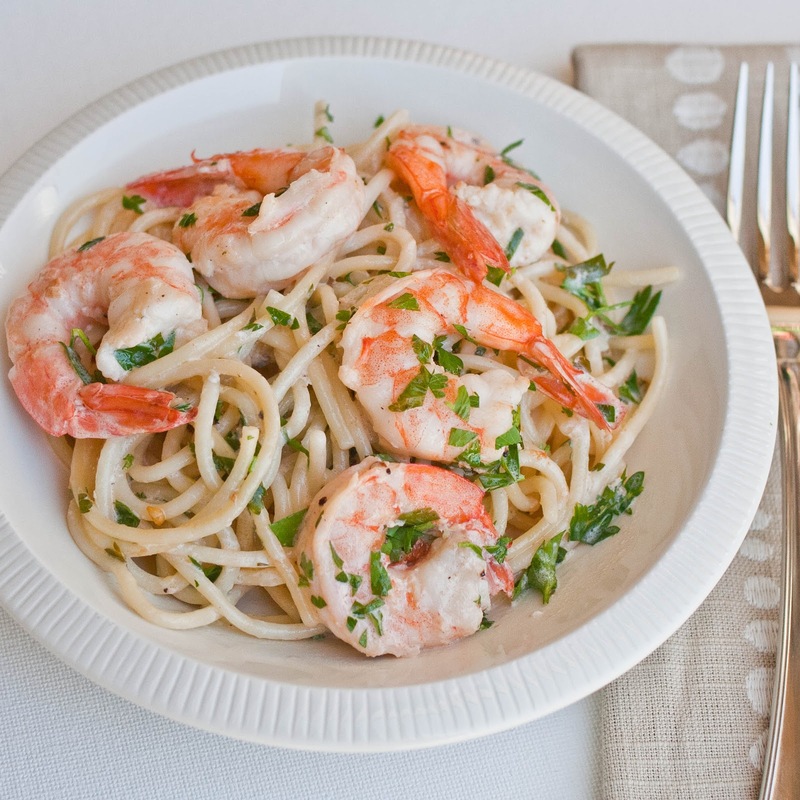 This shrimp pasta might be for you! You probably have most of those things on-hand in your pantry. 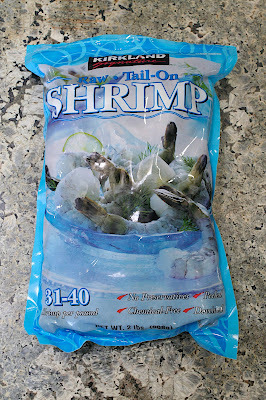 I used the shrimp from Costco in the frozen section, not exactly this bag, but the 21-25 per pound. I thought I was getting the less expensive one, but the one I got was good, the shrimp were fairly big. Costco sells the 21-25 per pound bag of shrimp for $18.89, and I used the whole bag. It's kind of a lot, but I wanted to make something special since Rick & Jessica were coming for dinner. When compared with what this kind of dish would cost in a restaurant, and it was basically all-you-can-eat, the cost seemed okay. There was enough left for Gary's dinner tonight, too. Like I always say, it's all about perspective. 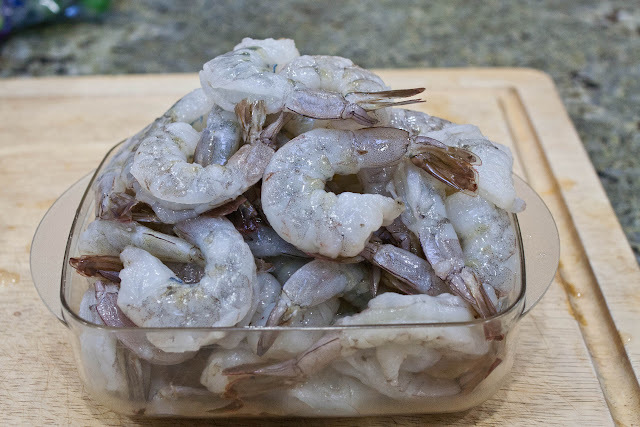 The shrimp are easy to defrost, I put them in a colander and ran some cold water over them, then let them sit for a few minutes. I did that twice, while I was getting the other ingredients ready. I think the key to this dish is to have it all ready ahead of time, since it cooks fast. There isn't time to be running to the pantry to get this and that. 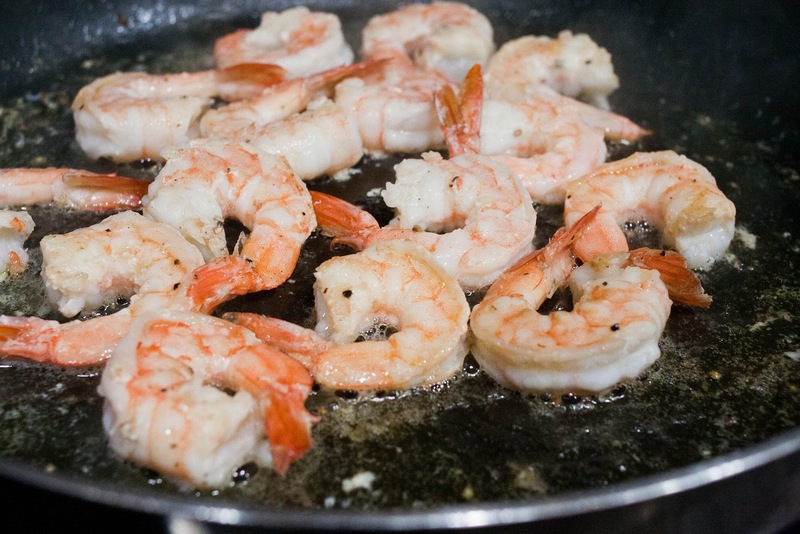 The shrimp cook so fast, and you don't want them to get over-cooked, otherwise they'll get small and hard. Micro-plane the zest from one lemon and juice two. 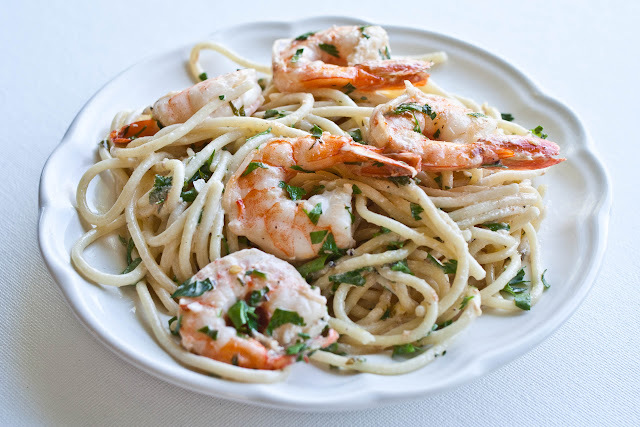 You'll also need to mince 4 cloves of garlic and a couple of tablespoons of parsley. Have ready a half-cup to one cup of sake, 1 cup of whipping cream or half & half, 1 teaspoon of chili flakes (less if you can't take the heat--then get out of the kitchen---sorry, I couldn't resist! 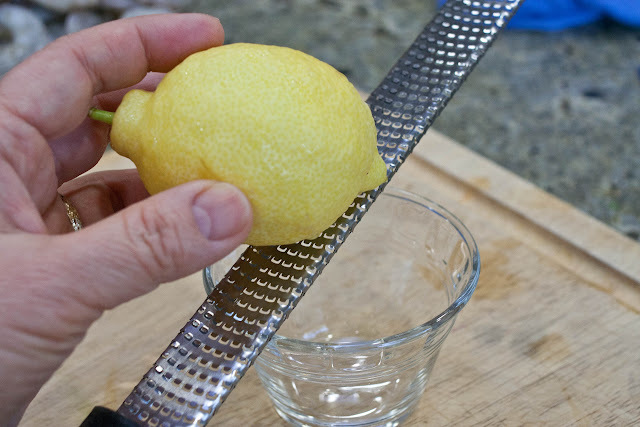 ), About 2 tablespoons of butter and 2 tablespoons of olive oil. When all the ingredients are gathered and ready to go, start cooking the pasta. 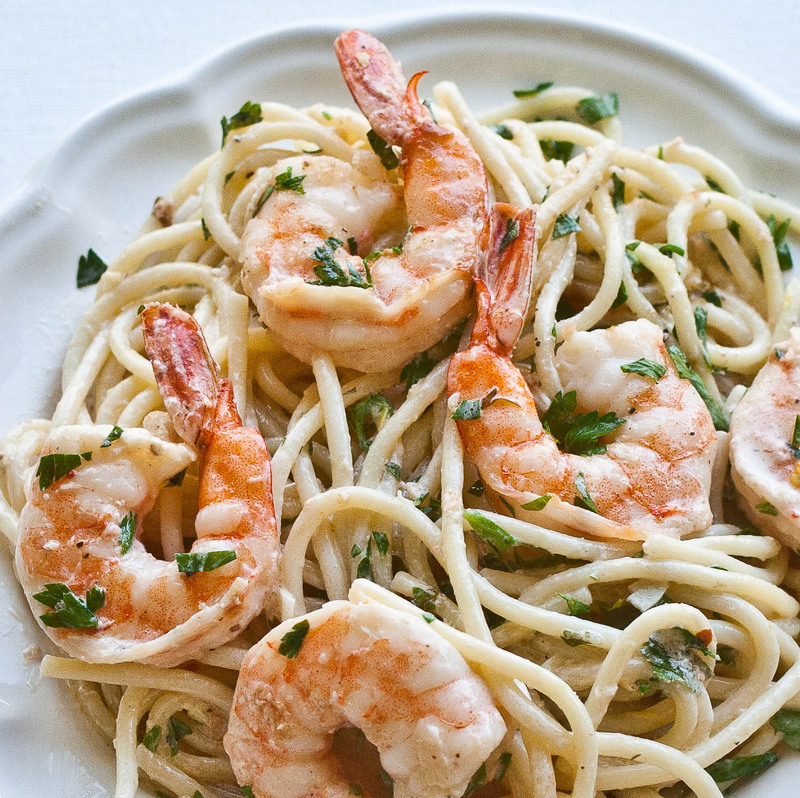 Heat the butter, olive oil and garlic in a skillet. You don't want the heat too high, you don't want the garlic to brown. 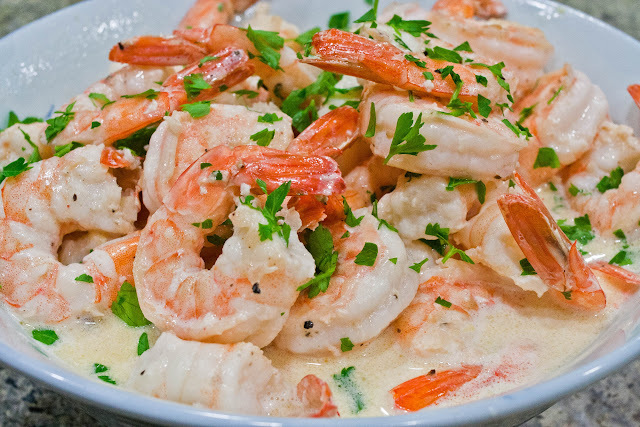 Add the shrimp in one layer, and turn each one over when it starts to change color. Lightly salt and pepper the shrimp. Remove them from the pan when they start to curl. Don't worry if it's not quite done, it's better to have them underdone at this point. If they look like this, then they're done. Don't worry, you're not going to undercook them, a little less curled than this is ideal. You're going to return them to the pan in a couple of minutes. When all the shrimp are done, add the sake (or a white wine you like) and chili flakes to the pan. 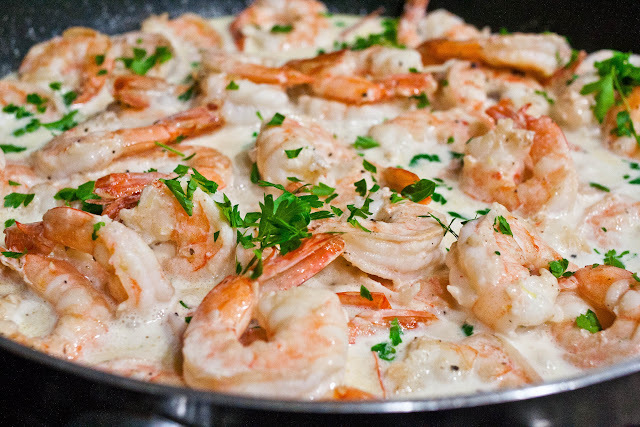 When it starts to simmer, add the cream, and when that starts to simmer add the lemon juice and shrimp. Add the shrimp at the very end. Toss gently and remove from heat. The pasta should be done by now, and you're ready to eat! A big thanks to Wes and Laura for the photography advice! Karen hasn't been able to post here since she's been so busy with work, but she's been cooking up a storm. I'll post some photos as soon as she makes them available. I decided to send her some potholders since I was sending them out to our contest winners. She got them--just 'cause. Just 'cause she's the best daughter and I love her to pieces. She sent me this picture yesterday! I didn't tell her she was getting them. Here's Karen and her husband Mitchell on their honeymoon last year in Peru. Karen and I love soup. She's eating chupe de camarones. Mitchell said you can get a fantastic meal for just a few dollars. 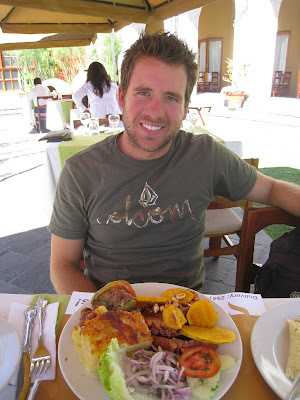 He's eating rocoto relleno and a pastel de papas. When the kids travel, I always ask them to be sure and take lots of pictures of the food. I like to see what people in other countries are eating. Thinking of going organic now? Too funny, Karolyn! This morning I decided to make Shrimp and Pesto Pasta for dinner tonight! 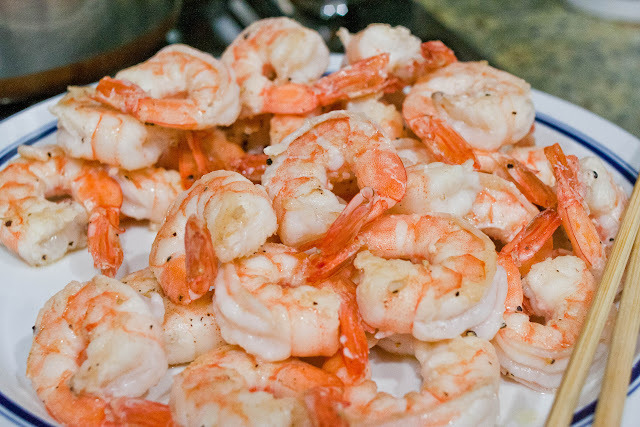 Mmm, I will cook my shrimp like you showed here! Thanks! I just got my potholders and they are so super cute!! thank you so much again!! I just love your blog! 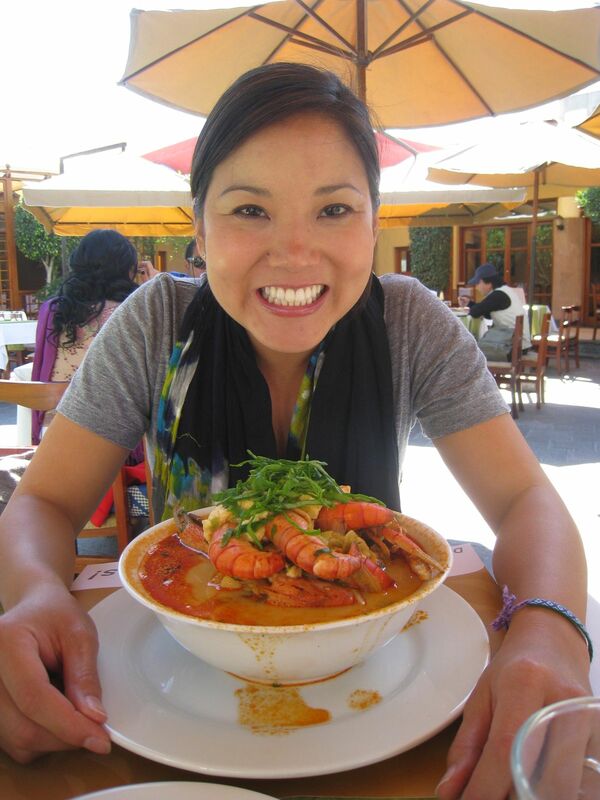 I am a friend of Karen's at Stanford and we made your mochi recipe last week. It was great! Thanks for the great recipes and for having such a great daughter!